The mycobacteriophage large serine recombinase Bxb1 catalyzes site-specific recombination between its corresponding attP and attB recognition sites. Previously, we and others have shown that Bxb1 has catalytic activity in various eukaryotic species including Nicotiana tabacum, Schizosaccharomyces pombe, insects and mammalian cells. In this work, the Bxb1 recombinase gene was transformed and constitutively expressed in Arabidopsis thaliana plants harboring a chromosomally integrated attP and attB-flanked target sequence. The Bxb1 recombinase successfully excised the target sequence in a conservative manner and the resulting recombination event was heritably transmitted to subsequent generations in the absence of the recombinase transgene. In addition, we also show that Bxb1 recombinase expressing plants can be manually crossed with att-flanked target transgenic plants to generate excised progeny. The Bxb1 large serine recombinase performs site-specific recombination in Arabidopsis thaliana germinal tissue, producing stable lines free of unwanted DNA. The precise site-specific deletion produced by Bxb1 in planta demonstrates that this enzyme can be a useful tool for the genetic engineering of plants without selectable marker transgenes or other undesirable exogenous sequences. With the demonstration that foreign DNA can be stably introduced into plant cells in the 1980's, the generation of transgenic plants has become a commercial industry and its use in agriculture has continually grown with production surpassing 134 million Ha in 25 countries . The most commonly enhanced traits being herbicide tolerance, pest resistance, or both traits stacked together . The advancement of plant genetic engineering has led to more sophisticated techniques and strategies being utilized for value added crop production. For many years it has been known that the structure of a transgene locus can have a major influence on the level and stability of transgene expression. Therefore researchers have studied methods for precise DNA integration with particularly interest in how to stack transgenes 'cleanly' to prevent interaction with the plant's genome defense and silencing systems. The idea of 'clean' integration and or stacking benefits commercialization for it addresses concerns by the public and regulatory authorities . Therefore as the practices of transgenic technology are coming under greater scrutiny, research focusing on eliminating marker genes and vector sequences, and controlling the integration of transgenes with regard to copy number, orientation, and rearrangements has been pursued. Site-specific recombinase technology is a prominent tool for improving the precision by which crops are genetically engineered. In the last several years, recombinases have been shown to eliminate unneeded DNA, resolve multimers and perform site-specific targeted integration in a variety of species. 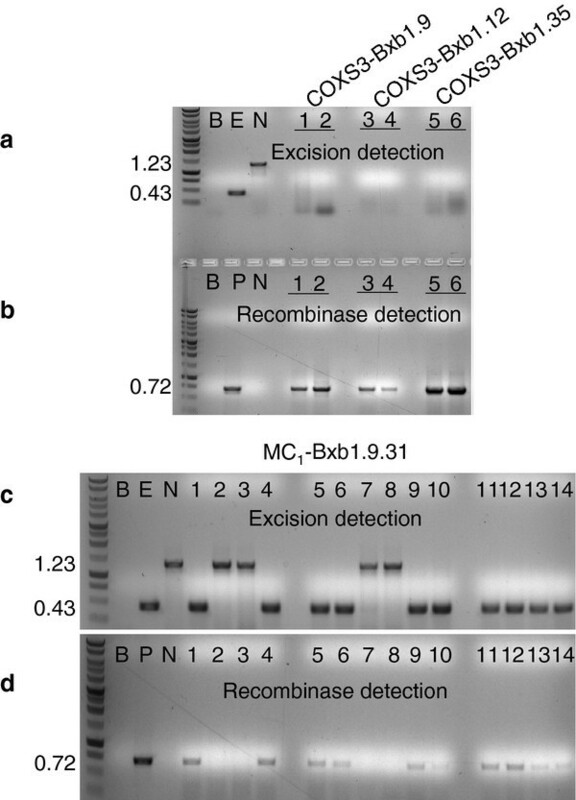 The novel site-specific recombinase Bxb1, isolated from mycobacteriophage Bxb1, belongs to the large serine recombinase sub-family . Large serine recombinases act on two unique sequences, known as the recognition sites attP and attB, to yield the product sites known as attL and attR . Depending on the relative orientation of the attP and attB sites, the reaction can result in excision, inversion or integration of sequences between the recognition sites, and is not reversible unless an additional protein, an excisionase, is present. Several recombinase systems of this type including Bxb1, TP901-1, U153 [5–7] and phiC31 , have been shown to function in eukaryotic cells. The Bxb1 recombinase is a 500 amino acid protein that binds minimal recognition sites attP and attB that are 39 bp and 34 bp, respectively and enzymatically executes uni-directional site-specific recombination . In vitro studies on the Bxb1 system have shown that it can catalyze site-specific recombination in the absence of other proteins or high-energy cofactors . The first plant study on the Bxb1-att system demonstrating its functionality was conducted in tobacco protoplasts . The Bxb1 system has also been shown to function in insect and mammalian tissue culture cells [11–13]. The uni-directional mode of action of the Bxb1-att system is an impotant attribute that differentiates its utility as a tool for genomic manipulation from other recombinase systems. For example, recombinases from the the small tyrosine family which have been shown to function in plants (i.e. Cre, FLP, R) all naturally perform bidirectional or fully reversible recombination reactions. In previous studies, we identified a number of prokaryotic site-specific recombination systems that function in the eukaryote Schizosaccharomyces pombe . 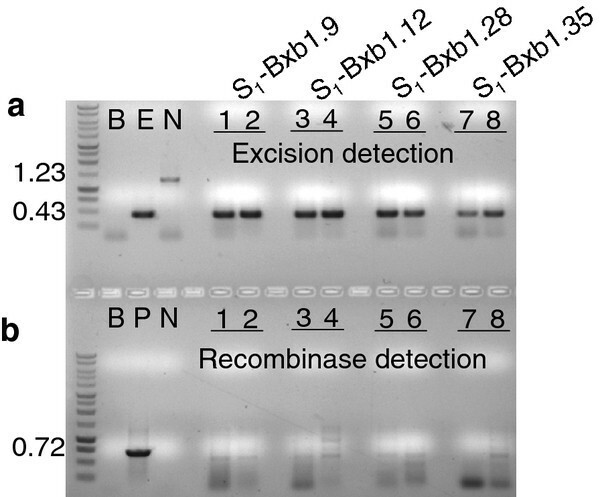 Among those, the Bxb1 uni-directional recombinase was highly efficient. The system has been successfully shown capable of recombinase mediated excision, inversion and integration reactions. While published evidence has demonstrated the Bxb1 system can mediate integration events in tobacco protoplasts , to our knowledge, heritable excision in planta has not been yet reported. In this research, we examined the ability of the Bxb1-att recombination system to mediate genomic site-specific excision from within the Arabidopsis germline. Plants transgenic for an attP and attB flanked target sequence were generated and subsequently retransformed with a second construct carrying the Bxb1 transgene. 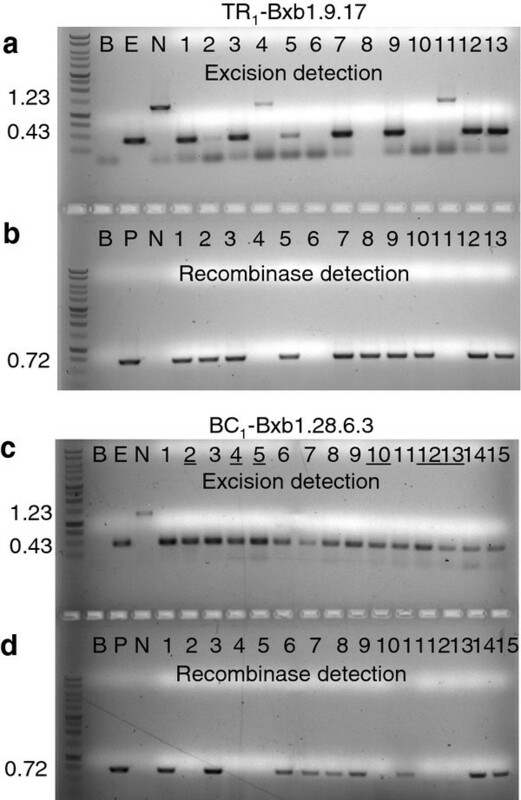 The ability of the Bxb1 recombinase to perform excision of the target sequence from four independent plant lines (i.e. four unique genomic locations) and generate stably excised progeny plants that carry only the recombined target DNA of interest was assessed. Here, we report on the efficiency by which the excision event was heritably transmitted to subsequent generations in the absence of the recombinase gene. To test for site-specific recombination, we initially sought to use a gain-of-function strategy whereby excision of a transgene would lead to promoter fusion with a previously distal marker . Hence, pN6-Bxb1 was configured with a CaMV 35S promoter (35S) proximal to a 760 bp stuffer region followed by a distal gusA coding region (Figure 1a). The stuffer region is flanked by directly oriented attP and attB recognition sites of the Bxb1 recombinase. The expectation was that prior to site-specific recombination, 35S would not drive expression of gusA due the presence of the stuffer region. After recombination, the stuffer would be removed and activate expression of the gusA reporter gene (Figure 1c). In this strategy, we first introduced the recombination target (pN6-Bxb1) into the Arabidopsis genome via Agrobacterium transformation. These target lines, or 'TA' lines, were then transformed with the second construct, pCOXS3-Bxb1 (Figure 1b) that expresses the recombinase gene to produce the 'TR' lines. Upon site-specific excision of the recognition site-flanked DNA, the TR1 plants were back crossed to wild type plants and the BC1 progeny screened for segregants that retain the excision event but lack the recombinase gene. Lines positive for excision but negative for the recombinase gene were self-fertilized. To remove possible de novo recombinase expression contamination to the BC1 results the 'selfed' progeny (S1) lines were analyzed as a final confirmation for germinal transmission. A similar strategy was employed in previous recombinase research on phiC31 . T-DNA structures (not to scale) from a) pN6-Bxb1; b) pCOXS3-Bxb1; and c) predicted single copy T-DNA structures after excision of stuffer by Bxb1- att recombination. PCR primers shown as e, f, g, h; att sites as grey arrowheads; hybridization probes as grey rectangles. Abbreviations: B, BamHI; E, EcoRI; V, EcoRV, RB, T-DNA right border; LB, T-DNA left border, P OXS3 Arabidopsis OXS3 promoter. Length in kb of PCR products (dotted lines) and DNA fragments (dashed lines). d) Sequence of the 51 bp attP and 42 bp attB Bxb1 recognition sites, where the minimal required sequence is underlined and the 2 nucleotide 'gt' core region of crossover is in bold. e) sequence of a PCR product detecting a conservative site-specific excision event. Not shown are gene terminators and promoters for hptII (hygromycin phosphotransferase II) and nptII (neomycin phosphotransferase II) and gusA (β-glucuronidase). The target construct pN6-Bxb1 was introduced into Arabidopsis, and 44 hygromycin resistant lines were confirmed by PCR detection of a 1.23 kb product that spans the recognition site-flanked stuffer region (data not shown). 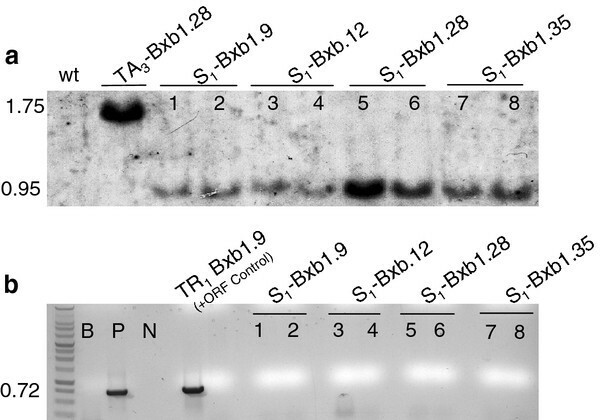 Of those, 23 pN6-Bxb1 lines were propagated to the TA2 generation and examined by Southern blot for single copy T-DNA integration. EcoRI or BamHI each cuts once within the target T-DNA (Figure 1a). Hybridization with a gusA probe of EcoRI or BamHI cleaved genomic DNA should reveal a band size > 4.10 kb, the length of the cleaved T-DNA. A hybridizing band < 4.10 kb would indicate integration of a truncated T-DNA. From this analysis, 4 of the 23 pN6-Bxb1 plants were determined to contain a single copy of a likely complete T-DNA (data not shown) and designated TA2-Bxb1.9, 12, 28 and 35. The 1.23 kb PCR product from each of these lines was sequenced to confirm the presence of intact attP and attB sites (Figure 1d). As previous research has demonstrated successful germline tissue expression of other recombinase genes , we again chose the 1.5 kb promoter fragment of the Arabidopsis Ox idative S tress 3 gene (OXS3, At5g56550)  for Bxb1 transgene expression and generated the plasmid construct pCOXS3-Bxb1 (Figure 1b). The TA3 generation of Bxb1.9, 12, 28 & 35 plant lines were transformed with Agrobacterium harboring the pCOXS3-Bxb1 vector producing the TR1 plant lines. Kanamycin resistant transformants that exhibited a wild type appearance and growth rate were identified and grown in the greenhouse. Three-week old TR1 transformants were tested for the presence of the Bxb1 gene. PCR amplification by primers gand h(Figure 1b) showed that a majority of the plants harbor the recombinase gene (Figure 2b). The groups of plants that harbor the Bxb1 gene were designated TR1-Bxb1.9, 12, 28 and 35 (Table 1). PCR analysis for detection of site-specific recombination and the recombinase transgene in the retransformation (TR 1 ) and back cross (BC 1 ) generations. PCR reactions (a, c) with primers eand f(Figure 1) or (b, d) with primers gand h(Figure 1) on representative plant DNAs. a, b) retransformed TR1-Bxb1.9.17 lines. c, d) Back crossed line BC1-Bxb1.28.6.3. Control lanes are B (blank, no DNA); E (excision, pN6-Bxb1exc DNA); N (no excision, pN6-Bxb1); P (pCOXS3-Bxb1). c) Lane numbers underlined indicate presence of excision event in the absence for the Bxb1 gene. The TR1-Bxb1 lines were examined using histochemical staining to detect gusA encoded reporter gene activity. The TR1-Bxb1 lines, however, exhibited variable levels of β-glucuronidase activity. One interpretation of this reduced activity is that the lines were undergoing low levels of Bxb1-mediated excision, but PCR analysis of lines where GUS activity was weak or undetectable were positive for excision of the target DNA. Given that the screening for GUS activity was not a reliable indicator of Bxb1 site-specific recombination, we subsequently utilized PCR to screen for site-specific excision. With the 48 TR1-Bxb1.9, 78 TR1-Bxb1.12, 18 TR1-Bxb1.28 and 44 TR1-Bxb1.35 individuals, PCR with primers eand f(Figure 1c) detected a 0.43 kb product expected for site-specific excision (Figure 2, Table 1). However, the 1.23 kb product representing the parental configuration was also detected in some individuals, which indicates the presence of unexcised target DNA. As each individual harbors an independent COXS3-Bxb1 T-DNA integration at a different genomic location, with perhaps a different copy number or structural arrangements, the incomplete excision in some individuals was likely due to variability in recombinase gene expression. Based on the genomic PCR results, 35-89% of the Bxb1 positive TR1 plants generated only the 0.43 kb excision PCR product (Table 1). To determine if the genomic excision event occurred in the germline tissue, we examined whether the excised target was heritably transmitted to the progeny lacking the Bxb1 gene. This analysis also determines whether or not the excision reaction was generated de novo in each generation. Individuals were chosen from each of the TR1-Bxb1.9, TR1-Bxb1.12 TR1-Bxb1.28 and TR1-Bxb1.35 families (Table 2) to pollinate wild type recipients. The backcross progenies (BC1) were grown without selection and then screened by PCR for the target locus (primers eand f) and the recombinase gene (primers gand h), which reveals whether excision occurred (0.43 kb band) or not (1.23 kb band) and if Bxb1 was present or absent. With the TR1-Bxb1.9, TR1-Bxb1.12, TR1-Bxb1.28 and TR1-Bxb1.35, 75% (229 of 306), 65% (70 of 107), 95% (156 of 165) and 73% (222 of 306) of the BC1 plants harbored the target DNA, respectively (Table 2). For the nine TR1-Bxb1.9 plants that were backcrossed, 77% of the progeny plants (177 of 229) that harbor the target locus showed excision of the attP and attB-flanked DNA, with 21% (37 of 177) lacking the recombinase gene (Table 2). Of the TR1-Bxb1.12 plants, 61% (43 of 70) of target plants showed excision of the attP and attB-flanked target, and 9.3% (4 of 43) lack the recombinase gene (Table 2). A total of 87% of the TR1-Bxb1.28 plants (135 of 156) harbor the target locus with excision of the attP and attB-flanked DNA, 24% (32 of 135) lack the recombinase gene (Figure 2c, d; Table 2). Out of the ten TR1-Bxb1.35 plants that were backcrossed, 78% of the plants (173 of 222) that harbor the target locus showed excision of the attP and attB-flanked DNA, with 16% (27 of 173) lacking the recombinase gene. The genomic excision 0.43 kb PCR product from two representative individuals from each family was sequenced and examined for conservative recombination. All eight Bxb1-mediated excision PCR products sequenced were conservative and site specific (Figure 1e). BC1 plants that showed excision but lacked the recombinase gene were self-fertilized to generate progeny designated S1-Bxb1. PCR analysis on these plants confirmed the inheritance of the excision event in the absence of the Bxb1 recombinase gene (Figure 3), which indicates germinal transmission. For further molecular confirmation, Southern blot hybridization was conducted on two selected S1 individuals. The genomic DNA was isolated and cleaved with EcoRV, which is expected to liberate either a 1.60 kb or a 0.95 kb fragment from the non-recombined or recombined structure, respectively (Figure 1a, c). The GUS1350 probe detected the 1.60 kb band in the parental lines but not in the S1 plants (Figure 4a, lanes 1-8). Instead, only the 0.95 kb band was observed for S1 plants from the TR1-Bxb1 lineage. The genomic DNA was also PCR amplified with primers gand h(Figure 1b), which would generate a 0.72 kb fragment if the genome were to harbor a COXS3-Bxb1 T-DNA. Whole plant genomic DNA was PCR amplified to ensure the absence of the Bxb1 transgene since previous screening methods only used DNA from individual leaves and could miss mosaic plants. Amplification detected the Bxb1 gene fragment in the parental control plants but not in the S1 plants, validating that these excision positive plants were recombinase negative (Figure 4b, lanes 1-8). PCR analysis for site-specific recombination and the presence of the recombinase gene in the selfed (S 1 ) generation. PCR reactions (a) with primers eand for (b) with primers gand hon representative plant DNAs. a, b) Selfed lines (lanes 1, 2) S1-Bxb1.9; (lanes 3, 4) S1-Bxb1.12; (lane 5, 6) S1-Bxb1.28; (lane 7, 8) S1-Bxb1.35 positive for excised target but the Bxb1 transgene is absent. Control lanes are B (blank, no DNA); E (excision, pN6-Bxb1exc DNA); N (no excision, pN6-Bxb1); P (pCOXS3-Bxb1). S 1 plants examined by Southern blot analysis and whole plant genomic PCR. (a) Genomic DNA cleaved with EcoRV hybridized with a 32P-labeled GUS1350 probe (Figure 1). (b) Genomic DNA PCR amplified with with primers e and f. Plant lines (lanes 1, 2) S1-Bxb1.9; (lanes 3, 4) S1-Bxb1.12; (lane 5, 6) S1-Bxb1.28; (lane 7, 8) S1-Bxb1.35. Control lanes are wt (wild type Arabidopsis DNA) and TA3-Bxb1.9, (target lines). We further isolated, by segregation, Bxb1 recombinase expression lines for the purpose of crossing to the original TA3 target lines to determine if a genomic excision event could be facilitated using this alternative approach. Two independent lines from each of three (TR1-Bxb1.9, 12, and 35) secondary transformation events were isolated from segregating populations via PCR (Table 2) and designated lines COXS3-9.17, 9.31; COXS3-12.69, 12.72 and COXS3-35.15, 35.33. Recombinase expression lines were not isolated from the TR1-Bxb1.28 transformation event due to the apparent homozygosity of original TA3-Bxb1.28 target line (Figure 5a, b; Table 2). Each of these six independently isolated lines was crossed to the original target line TA3-Bxb1.28. The manually crossed progenies (MC1) were grown without selection and screened by PCR for the target locus (primers eand f) and the recombinase gene (primers gand h; Figure 5c, d). Of the MC1-Bxb1.9 plants that carried both the target locus and Bxb1 gene, 100% (47 of 47) of the tested individuals displayed the 0.43 kb excision band in the absence of the unexcised 1.23 kb target band when screened using PCR (Table 3; Figure 5c, d). Of the MC1-Bxb1.12 plants with both the target and Bxb1, 80% (17 of 21) generated only the 0.43 kb excision PCR product (Table 3). While 63% (37 of 59) of the MC1-Bxb1.35 individuals generated only the 0.43 kb PCR product derived from an excised genomic target (Table 3). PCR analysis for site-specific recombination and the presence of the recombinase gene the manual cross (MC 1 ) generation. PCR reactions (a, c) with primers eand for (b, d) with primers gand hon representative plant DNAs. a, b) Segregated lines (lanes 1, 2) S1-Bxb1.9; (lanes 3, 4) S1-Bxb1.12; (lane 5, 6) S1-Bxb1.35; (lane 7, 8) S1-Bxb1.28 negative for excised target but positive for Bxb1 gene. As target line TA3-Bxb1.28 appears to be homozygous no Bxb1 expression lines were derived from the retransformation event. c, d) MC1-Bxb1.9.31 with predicted, excision events (0.43 kb) only appearing in lanes when the recombinase gene is present (0.72 kb). Control lanes are B (blank, no DNA); E (excision, pN6-Bxb1exc DNA); N (no excision, pN6-Bxb1); P (pCOXS3-Bxb1). This research investigated the Bxb1 recombination system as a potential tool for the precise removal of plant transgenes. Use of such technology potentially allows the production of crops with increased yield, resistance to key stresses like disease and drought , improve bioenergy production, and new food products that provide valuable health benefits while eliminating the retention of unneeded "marker" genes. This in turn addresses concern relative to both human consumption and potential for transfer of these transgenes that confer antibiotic or herbicide resistance to organisms within the environment . Recombinase-mediated genetic engineering provides a favorable method for enhancing the precision of biotechnology allowing not only marker removal but also facilitating site-specific introduction of a transgene as a single copy into the genome thereby eliminating the random nature of conventional transgene integration. Our interest in site-specific recombination lies in its ability to facilitate crop improvement through controlled engineering of the plant genome. 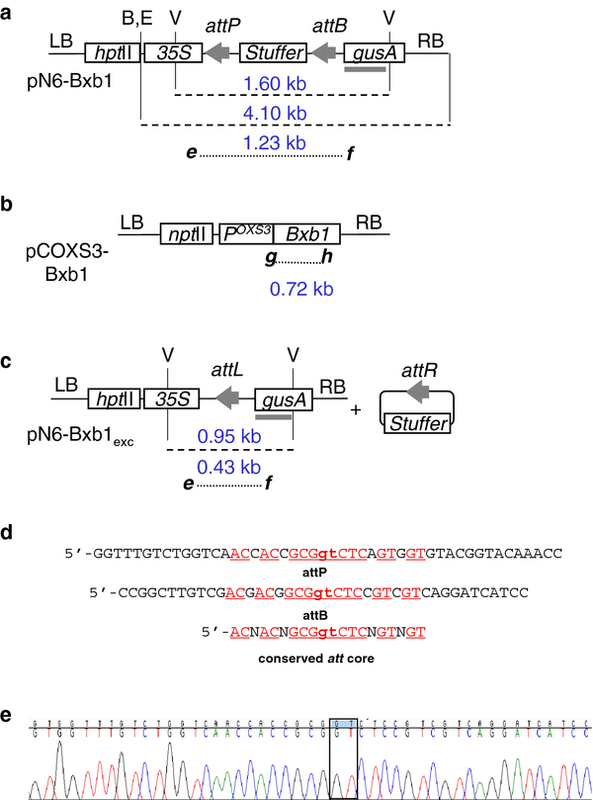 The Bxb1 serine recombinase has uni-directional recombination activity and has the capacity for excision, inversion and integration within the plant genome. The strategy as initially designed was based on the assumption that we could use gusA expression as a reporter of site-specific recombination. The pattern of GUS enzyme activity would reveal genomic excision of the target sequence and any tissue specificity in the observed recombination activity. This strategy, however, failed to perform as desired with initial excised plants having either weak GUS staining or not producing any detectable β-glucuronidase activity. Subsequent analysis of the original TR1-Bxb1 progeny confirmed that use of reporter enzyme activity was an unreliable indicator of excision. We had also observed this phenomenon with other constructs used in both Arabidopsis and S. pombe [5, 6, 15]. It is possible that the 47 bp attP/B hybrid sequence present within the transcript leader sequence of the gusA gene may cause poor expression due to methylation or by some other mechanism that inhibits gene expression. Due to this circumstance, the analysis and scoring of site-specific excision were performed using PCR. Site-specific excision was detected in all TR1-Bxb1.9, TR1-Bxb1.12, TR1-Bxb1.28 and TR1-Bxb1.35 plants. The majority (72%) of the plants containing excision of the target sequence were exclusively positive for the 0.43 kb excision band in the absence of the 1.23 kb unexcised target band. This suggests that efficient Bxb1-mediated excision of the four target lines within the Arabidopsis genome. Indeed, when segregants derived from TR1 lines, containing only the Bxb1 expression cassette were manually crossed with TA-Bxb1.28 target plants, 80% (101/127) of the progeny generated only the 0.43 kb excised target PCR product, again independently demonstrating that Bxb1 functions well in these plants. From analysis of the BC1 plants, 78.0% (528 of 677) of those derived from the four TR1-Bxb1 lines showed evidence of excision, while in a previous line of research 77.3%, 85.6% and 99.6% of the BC1 plants of the TR1-ParA, phiC31 and Cre lines, respectively exhibited excision [6, 15]. By this measure, it appears that the native Bxb1 recombinase mediated excision occurs with efficiency comparable to ParA and phiC31 and approaching that of the Cre-lox system. It is possible that through optimization and or the addition of a nuclear localization signal that Bxb1 can be enhanced to even higher levels of activity in plants. Although, the majority of the BC1 lines displayed excised genomic target, it is difficult to give a precise quantitative assessment of the Bxb1 activity since only a modest number of different target locations were thoroughly characterized and direct comparison to other recombinases was not addressed. Variability in copy number and chromosome locations of the Bxb1 gene can affect the amount of recombinase protein produced and thus may impact the efficiency of the excision reaction observed, making a direct comparison difficult. As an alternative method of recombinase introduction into the plant target lines, hand pollination between Bxb1 recombinase expressing plants and pN6-Bxb1 target plants was performed. PCR analysis of the manually crossed MC1 progeny demonstrated that this is a viable method for the generation of individuals with genomic target excision (Figure 5). However, it was observed that like secondary Agrobacterium transformation with the recombinase expression cassette, the genomic excision results varied between lines (Table 3). Use of a demonstrated recombinase expression line such as COXS3-9.17 enabled sufficient recombinase mediated excision events to excise all target DNA when crossed together. It was also observed that segregation of the secondary Agrobacterium transformed TR1 lines, without benefit of backcrossing, produced excised target and recombinase expression-only T-DNA lines in the TR2 and TR3 generations (data not shown). This indicates that the Bxb1 expression T-DNA in these lines was at a single locus or a low number loci within the genome and that expression was sufficient to facilitate recombination, allowing segregation by self-pollination. Since PCR assays of genomic DNA from leaf tissue only indicates that excision has occurred in somatic cells, we utilized Southern blot analysis to ascertain whether target sequence removal had occurred in the germline. As long as Bxb1 DNA was present in the genome, or the Bxb1 protein was present in the germline cells, the possibility that recombination was generated de novo could not be ruled out. Hence, BC1 plants were screened by PCR for the absence of the Bxb1 recombinase gene, and the following generation (S1 plants) was confirmed by Southern blot hybridization. As is shown in (Figure 4 lanes #1 - 8) germinal transmission of the genomic excision event in the absence of the Bxb1 recombinase gene occurred, illustrating that the production of stable lines with the unwanted DNA removed can be achieved. Precise genomic integration is another benefit of recombinase technology and allows the use of more sophisticated recombinase applications . Production of precisely controlled transgenic plants through site-specific integration has been reported to function in Arabidopsis, tobacco and rice [19–28] with Cre, Flp and R recombinase systems. The Bxb1 recombinase with its uni-directional catalytic activity presents an alternative way to facilitate stable site-specific integration events without the elaborate strategies required by the bi-directional systems. Peer-reviewed literature reported that Bxb1 is capable of genome targeting in insect cells  and targeted integration into the genome of tobacco . Utilization of Bxb1 for genome modification could be facilitated through the identification of cryptic attP or attB sites as potential locations for transgene introduction as shown by work with phiC31 in the mammalian genome . As our lab is interested in pursuing targeted integration using active 'cryptic' sites, we searched the Arabidopsis thaliana genome for the presence of sequences similar to the Bxb1 att sites. Using BLASTn and FuzzNuc http://embossgui.sourceforge.net/demo/fuzznuc.html searches we identified 27 Arabidopsis sequences with > 60% nucleotide identity with the minimal 48 bp attP and 42 bp attB sites. A total of eighteen sequences had 29 or 30 matches (60-63% identity) to the 48 bp attP sequence, while nine sequences had 27-29 nucleotides in common (64-69% identity) with the 42 bp Bxb1 attB sequence (Additional file 1: Figure S1a, b). While nine of these sequences contained the conserved central core "GT" sequence (Figure 1d) required for Bxb1-mediated recombination, most of these sequences did not (Additional file 1: Figure S1a, b). Since the dinucleotide core of the Bxb1 att sites is required for both homology matching and site orientation in the recombination reaction , we repeated the Bxb1 att-like sequence genome search using only the core sequence conserved between the attP and attB sites as the query (Figure 1d, red text). This second search identified nine sequences which contain only two mismatches compared to the conserved core att sequence. Five of these sequences contained 50-56% overall identity with attP (Additional file 1: Figure S1c) and six with 50-62% overall identity with attB (Additional file 1: Figure S1d). Most of these contained the required GT core sequence. Two of these sequences (marked with an asterisk in (Additional file 1: Figure S1c, d), were among the most similar to both attP and attB sequences. Next we mapped these 36 att-like sequences onto the five Arabidopsis chromosomes. A diagram displaying the location and orientation of the att-like sequences is shown in (Additional file 2: Figure S2). The closest directly oriented sites are located approximately 105 kb apart near the telomere of chromosome 4. Although both of these sequences have high overall identity with att sites (> 62%), neither contains the conserved GT core sequence (Additional file 1: Figure S1, Additional file 2: Figure S2) making Bxb1-mediated recombination highly unlikely. Similarly, there are no instances in the genome where attP- and attB-like sequences both contain the central dinucleotide "GT" and occur in direct orientation on the same chromosome (Additional file 1: Figure S1, Additional file 2: Figure S2). Taken together, the limited overall sequence similarity to attP and attB, the lack of the required central "GT" within most of the att-like sequences, and their dispersed chromosomal location within the genome, suggest that the potential for Bxb1-mediated recombination of endogenous Arabidopsis sequences within the genome is quite low. Consistent with this observation, the OXS3 promoter-Bxb1 transgenic plants did not exhibit compromised viability, morphological or growth defects like was observed earlier for 35S-phiC31 transgenic Arabidopsis plants which commonly exhibited crinkled leaves . The presence of such phenotypic aberrations clearly indicate the importance of utilizing controlled recombinase transgene expression with the appropriate use of promoters. This research demonstrates that the Bxb1 recombinase successfully performs site-specific genome modification in Arabidopsis germline tissue. Plants actively expressing the Bxb1 transgene appeared phenotypically normal with seed set equivalent to wild type, suggesting that there are no detrimental impacts from constitutive expression. The excision events produced by Bxb1 were conservative site-specific deletions of the attP and attB-flanked DNA from the plant genome. In a majority (20 out of 39) of the transgenic lines examined, at least one BC1 segregant was recovered that contained a germinally transmitted excision event lacking the Bxb1 transgene. These results were molecularly validated with DNA blot hybridization and show that the secondary transformation strategy used in this study can be utilized to generate marker gene-free transgenic plants. This type of approach will be particularly useful in plants where cross pollination is either not possible or undesirable. In addition, we show that an alternative approach to marker gene removal using cross pollination between recombinase expressing and att-flanked target containing transgenic lines is also a viable strategy. Therefore, taken together the results clearly illustrate that the Bxb1-att system performs genomic excision removing unwanted DNA to generate stable recombinase-free Arabidopsis transgenic plants. pN6-Bxb1 (Figure 1a): An AscI-attP-stuffer-attB-NheI fragment was retrieved from pPB-Bxb1  and inserted into binary vector pCAMBIA-1301 http://www.cambia.org/daisy/cambia in which the NcoI site between 35S and gusA had been changed to AscI and SpeI. The vector contains hptII (hygromycin phosphotransferase gene) for selection in plants. The pN6-Bxb1exc control vector used in control "E" lanes (Figure 2a, c; Figure 3a; Figure 5a, c) was generated by removal of the non-coding stuffer region by Bxb1 recombinase-mediated excision in bacteria. pCOXS3-Bxb1 (Figure 1b): The Bxb1 ORF was Phusion (NEB, New England) PCR amplified with a 5' AscI and 3' NheI sites (underlined) and inserted into pCOXS3-ParA  to generate the final construct. Primers used were 5'-AGTCGGCGCGCC ATGAGAGCCCTGGTAGTCATCCG -3' and 5'-AGTCGCTAGC TCAAGACATTCCAGTATGAAGTCTTTCAACAACAGATCC -3'. The 1.5 kb fragment promoter of the OXS3 gene (At5g56550) from Arabidopsis thaliana (ecotype: Ler) was used to express the Bxb1 gene, as previously described [15, 16]. The pCAMBIA-2300 http://www.cambia.org/daisy/cambia, a binary vector with nptII (neomycin phosphotransferase II gene) for plant selection was used as the backbone for plant transformation. Agrobacterium tumefaciens GV3101 was used for transformation of Arabidopsis (ecotype: Ler) by the floral dip method  modified by adding 0.01% Silwet L-77 (Lehle Seeds, Round Rock, TX) to the infiltration medium. Primary transformants were selected on MS medium (Sigma), 1% sucrose, 0.7% agar with 20 μg/ml hygromycin or 50 μg/ml kanamycin as needed for 10 days prior to cultivation in soil. Genomic DNA was extracted by grinding a single leaf in 400 μl of buffer (200 mM Tris HCl pH 7.8, 250 mM NaCl, 25 mM EDTA, 0.5% SDS). After centrifugation and isopropanol precipitation, the pellet was washed with 70% ethanol and resuspended in 50 μl of water. PCR amplication was performed using two μl of genomic DNA in reactions with a total volume of 25 μl. Primers were (Figure 1): e(5'-ATATCTCCACTGACGTAAGG-3'), f(5'-ATCATCATCATAGACACACG-3' for N6-Bxb1); g(5'- ATGAGAGCCCTGGTAGTCATCCG-3'), h(5'-CGGAGATCATCGATCGCTTCAGC-3' for Bxb1). Gel images were digitized with a resolution of 200 dpi in black on white background TIF format. Genomic DNA was extracted from plant aerial portions using a modified cetyl-trimethyl-ammonium bromide method as described . The 0.79 kb GUS1350 32P-labeled probe was produced by Taq™ polymerase (Promega) using primers 5'-CAAGACCCTTCCTCTATATAAG-3' and 5'-CGAGTTCATAGAGATAACCTTC-3'. We express our thanks to Bryan Hernandez for technical assistance. References to a company and/or product by the USDA are only for purposes of information and do not imply approval or recommendation of the product to the exclusion of others that may also be suitable. Research was funded by USDA-ARS project 5325-21000-018-00D. JT designed the approach, constructed the plasmids, collected data and interpreted the research results. JT supervised RC, prepared and submitted the manuscript. RC and JS provided technical assistance with plant maintenance, DNA preparation, PCR data collection and analysis. Participated with manuscript preparation and editing. RT provided bioinformatics research on the cryptic attB and attP sites and performed Southern blot hybridization and analysis. Participated with manuscript preparation and editing. YY and YW provided assistance on background studies, data interpretation and manuscript editing. DO provided data interpretation and manuscript editing. All authors read and approved the final manuscript.